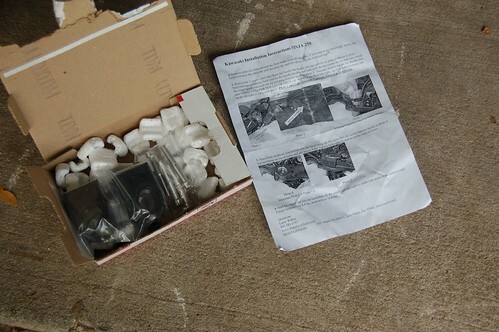 Right after I purchased my Ninja I ordered a set of handlebar risers for my Ninja 250 from Motorcycle Larry. 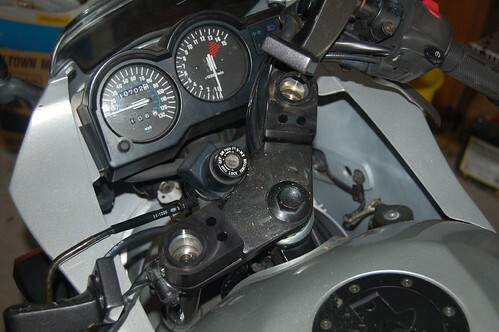 The Ninja 250 already has a fairly upright riding position, at least by the standards of modern sport bikes. I hadn’t really felt a strong need to install the risers until yesterday. Yesterday I rode approximately 370 miles to attend a Patriot Guard Mission (full ride report latter). I kind of felt a ‘hump’ developing in my back as I rode along, which motivated me to go ahead with the installation. 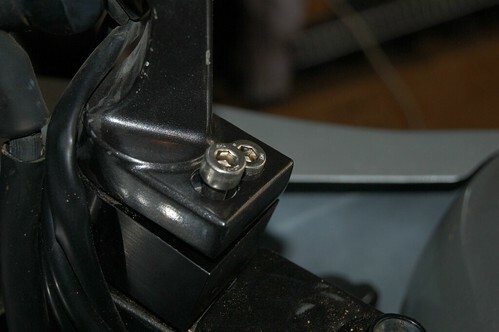 ‘Risers’ are just metal spacers that bolt between your motorcycle’s ‘triple tree’ and the handlebars. These risers raise the bars about an inch. There’s not a lot to them really. The MCL risers appear to be very high quality machine work. I’m really good at fixing things and doing maintenance. Well, as long as the ‘things’ are software. I’m less confident about my ability with a wrench. After studying the one page instructions and spending a good bit of time examining my bike I decided that this farkel was simple enough to be doable by me. I mention this because you should know that I am in no way an expert. 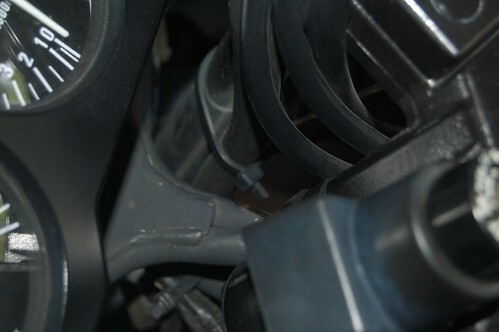 If you have any questions about how to do this modification contact MCL directly or consult an experienced mechanic! So without further adieu, here’s what I did. 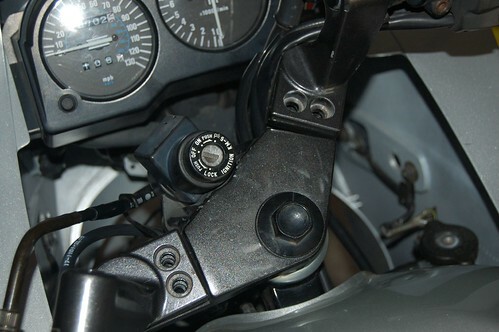 The first thing to do is pop off those four little round ‘buttons’ that cover the hex bolts holding the bars to the triple tree. Then carefully remove these bolts. 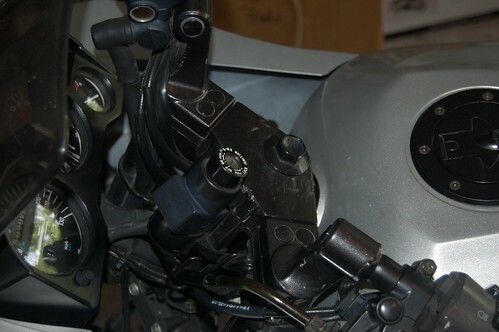 You will want to cut the tie wrap holding the cables to the right handlebar. 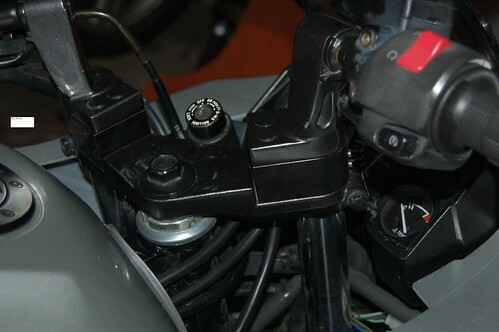 The brake line passes through a clip inside the fairing. I pushed this line up through the clip to give me the slack I needed for the risers. It’s important to have a good quality 6mm hex socket driver to do this work, I wouldn’t recommend trying this with a regular allen wrench. 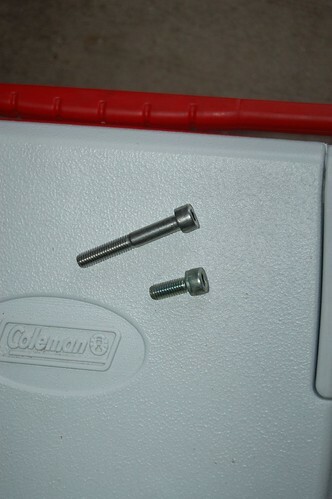 The new hold down bolts are about an inch and a half longer than the original bolts. The next step is to position the MCL riser blocks on the triple tree. That right handle is going to work despite all those cables, relax. Now for the fun part. Tighten the new hold down bolts. It takes a fair amount of turning. All the time I was doing this I’m thinking ‘don’t strip them, don’t strip them’. 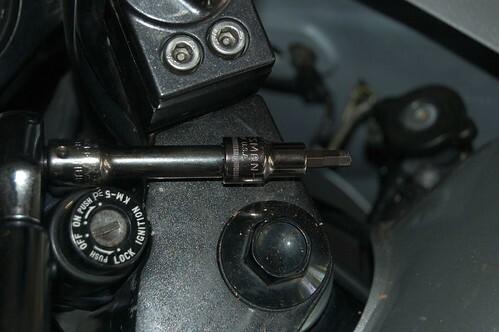 Keep the bolts in synch as you tighten, don’t tighten one all the way before doing the other. Use a torque wrench set to 8 foot-pounds to do the final tightening. 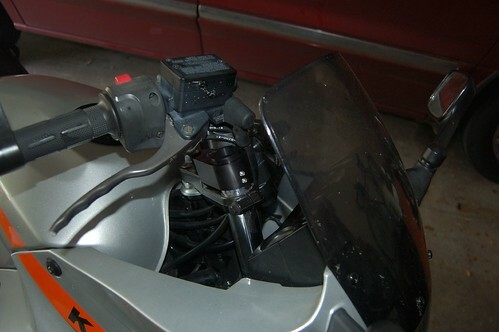 Once the bolts are tighten to specs, MCL says to start the bike and check that you can still move the bars lock to lock. I took the bike to the nearest big parking lot and went through the MSF slow speed exercises, and practiced parking. Everything seems to be fine, I didn’t notice any binding. I’ll be watching for any signs of chaffing on the cables. Save the original bolts in case you ever want to return to the stock configuration. Now excuse me, while I go riding! Watch this space, after I’ve had these a while I’ll update this post with a long term verdict.